1. Set up your grill with a high-heat zone and a low-heat zone. Preheat until the high-heat zone is searingly hot. Zucchini cut into planks, on the high heat side of the grill. They'll get flipped over again for a little more char before they're done. 2. As the grill heats, prepare the vegetables. Remove ends of zucchini, then slice zucchini lengthwise into planks about 1/2-inch thick, leaving the skin on. Peel onion and slice it into rounds about 1/2-inch thick (keep rounds intact for easier grilling). Brush any visible dirt off of mushroom. Shuck corn, removing husks and silk but keeping stems in place to use as handles for easier grilling. 3. Brush zucchini slices and onion rounds on both sides with olive oil. Brush flat mushroom top with olive oil. Season veggies liberally with salt and pepper. 4. Place the mushroom, flat side down facing flame, on the cooler side of the grill so it can cook through gradually while you work on the other vegetables. Place the zucchini slices on the hot side of the grill to sear, turning as needed to develop char on both sides. As they become charred, move them to the cooler side of the grill to finish cooking over gentle heat. As you make space on the hot side, replace the zucchini with the onion rounds. Carefully turn the rounds as needed to develop char on both sides, then move them to the cooler side of the grill to finish cooking through. As vegetables finish cooking on the cooler side, remove them to a large plate to make room for others. When done, they will be tender throughout but not mushy. Onion rounds and portobello mushroom sharing the grill with poblano chiles. 5. Finally, place the shucked ears of corn on the hot side of the grill, allowing some of the kernels to char. Turn the corn often as needed to cook evenly all over, moving them to the cooler side of the grill once they are charred. Corn will be cooked through in approximately 10 minutes total cooking time. Set all the vegetables aside uncovered (so they don't become soggy) as you warm the tortillas. Allow the embers to cool to a medium heat level after cooking the vegetables; or if using a gas grill, turn the heat to medium. Line a tortilla warmer with a clean cloth, or improvise one by lining a large sheet of aluminum foil with paper towels. Cover the top of the grill with a double thickness of aluminum foil, shiny side up. Working in batches, place the dry tortillas directly on the aluminum foil in a single layer, turning them with tongs or your fingers as needed to allow them to heat evenly without sticking. Flip them over halfway through, being careful not to tear them. (Most chefs find it easiest to use their fingers instead of tongs to flip the tortillas as they warm, so that they don't tear.) They are done, the tortillas should be soft and pliable, and not wet, and they should not brown noticeably. Tortillas warming on aluminum foil on the grill. As the tortillas finish warming, place them in the clean cloth or paper towels and cover them with the lid of the tortilla warmer or by wrapping the aluminum foil over them. As you finish more tortillas, add them as well, covering them immediately as you go. They will stay warm for up to 15-30 minutes or more if completely covered and kept in a warm room (or outdoors on a warm day). 7. Cut the kernels off the corn cobs into a large bowl, along with the diced roasted chiles. Cut the zucchini planks lengthwise into rectangles about 1/2-inch thick, then cut the rectangles crosswise into 1/2-inch cubes, and add them to the bowl. Cut the onion rounds into 1/2-inch cubes and add them to the bowl. Cut the mushroom top and softened parts of the stem near the top into smaller pieces than the others (about 1/4-inch is ideal) so that they can be distributed better throughout the mixture (discard the rest of the stem). Squeeze the juice from one of the limes and toss the vegetables with 1 teaspoon of the lime juice. Taste and add salt as needed. 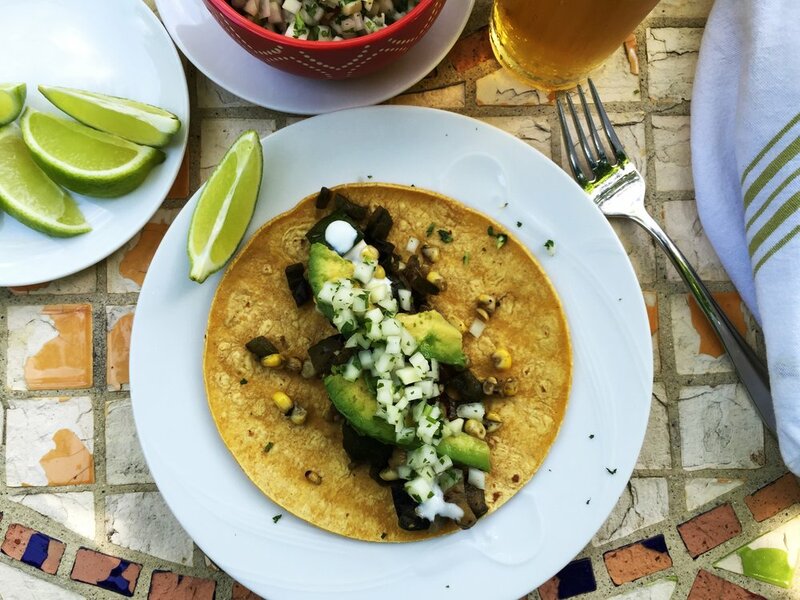 Tacos are ready, served with a cold beer. 8. Cut the remaining limes into wedges. Cut the avocados into thin slices. Place the avocado slices on a small plate and drizzle them with a little of the lime juice to keep them from browning. Taste the vegetable filling again and add a splash more lime juice or another pinch or two of salt if needed. 9. Set everything out buffet style: tortillas, vegetable filling, Mexican Crema (or sour cream), avocado slices, Kohlrabi Salsa Cruda and lime wedges. Each guest should fill a tortilla with the vegetable filling, drizzle a little crema over it, add a slice or two of avocado, followed by a spoonful of salsa cruda. Guests can use the lime wedges to add an extra squeeze of lime as they wish.